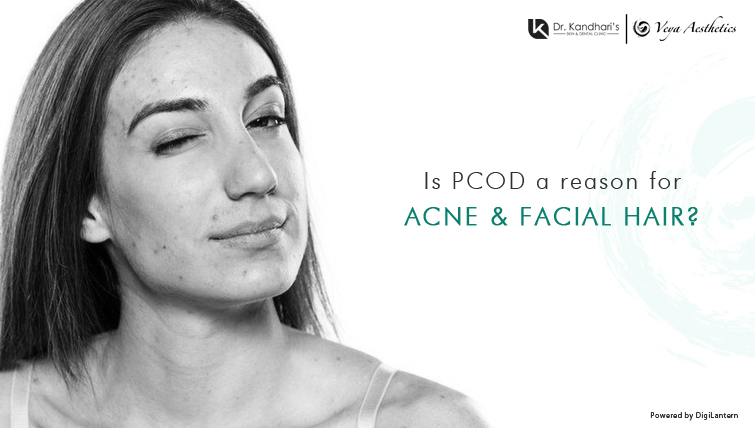 Is PCOD a reason for Acne & Facial Hair? PCOD or Poly Cystic Ovarian Disease (also known as polycystic ovarian syndrome) is characterized by small cysts in the ovary (visible on ultrasound examination), disturbed menstrual cycles, and signs of androgen excess (abnormal hair growth in areas such as the chin, chest etc., acne and hair fall). If you are suffering from PCOD then not only your menstrual cycle would be disturbed but it would also affect your fertility and other systemic functions. PCOD is a very common lifestyle disease and 1 out of 10 women is suffering from it as shown in various surveys. So, a lot of women suffer from acne and excessive facial hair without even realizing that it could be because of PCOS. The embarrassing and frustrating hair growth is due to the high androgen and testosterone levels occurring in PCOS. It is prudent at this point to seek the help of a qualified dermatologist and gynecologist who would suggest a healthy diet, lifestyle changes and if required medications to balance your hormones. Further the excessive hair associated with PCOS is best treated using dermatology treatments like laser hair reduction. There are other methods like waxing and threading too but in the long run they end up causing harm to your skin. The main advantage of laser hair reduction is the ability of the process to thin down the hair permanently, whereas with waxing, threading and plucking the hair get thicker with time leading to boils and further ingrown hair. The hair thins down considerably with laser hair reduction, becomes less visible and sparser in the treated area, further the effects are long lasting. At Dr. Kandhari’s Skin Clinic, we use a painless, high-speed, Diode Laser from Germany providing our patients not only a comfortable experience, but also complete information regarding the procedure including its pros and cons. The time taken for a session depends on the area which needs to be treated. Androgen or the male hormones result in oily skin which further causes acne breakouts. Again, it is imperative to follow a healthy diet to balance the hormones and control the over production of androgen. The sebaceous glands which secrete oil also become over active because of the changes in testosterone levels. Some of the facial areas which are more sensitive to hormonal imbalance will be more prone to acne such as the lower parts of the face including cheeks, chin, jawline and the neck, particularly in adults. Sometimes, it may also affect the chest and the back. Premenstrual exacerbation (acne breakouts prior to the menstrual cycles) are a common complaint in individuals with PCOS. a) Acne not responding easily to conventional OTC treatment and /or creams and ointments. e) Acne breakouts just before your menstrual cycle. In case you are experiencing any of the above symptoms it is best to consult an expert dermatologist who could guide you appropriately. Different skin types may demand different acne treatments, which include topical antibiotics, oral antibiotics, retinoids and chemical peels. Moreover, acne associated with PCOS if not treated appropriately may lead to scarring and is challenging to treat with high psycho-social impact. At Dr Kandhari’s we offer state of the art treatment for scar remodeling in the form of fractional lasers and fractional microneedle radiofrequency. Dr Rajat Kandhari, is not only passionate about scar remodeling but has orated on this topic at various national and international forums and taught numerous individuals his technique. He combines various modalities to provide the most optimal result for each individual scar. Please feel free to contact us at info@drkandhariclinic.com if you would like to know more about the treatment options for excessive hair and acne. Changing trends in Facial Beautification – The era of non surgical aesthetic treatments.